I checked in to 8 places, took 1 photo, and walked 3.8 miles. I was in Chicago and Lincolnwood. 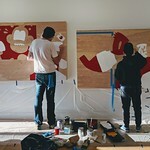 Walked into Gallerie F today to find Mosher and Sentrock painting some new pieces.